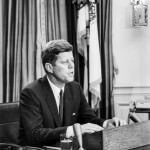 October 1962 » Including photographs from the Cuban Missile Crisis and its aftermath. 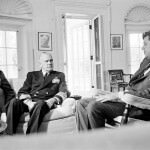 October 1962 – February 1963 » Cuban Missile Crisis and its aftermath. 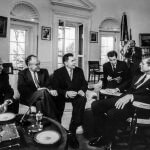 Photos from JFK’s White House taken during November 1962 in the aftermath of the Cuban Missile Crisis, including the ExComm and surveillance photos. 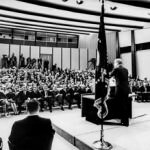 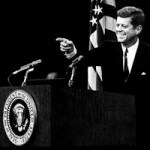 Photos from some of JFK’s 64 presidential press conferences. 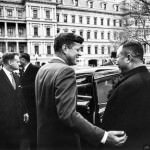 February 25, 1963 » The King of Laos, His Majest Sri Savang Vatthana, visits the White House. 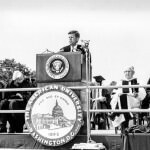 June 11, 1963 » President Kennedy’s Report to the American People on Civil Rights responding to the situation at the University of Alabama. 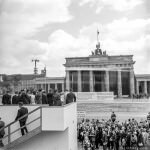 June 26, 1963 » JFK’s visit to West Berlin, including the Berlin Wall and the Brandenburg Gate. 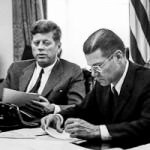 October 10, 1963 » JFK’s second Oval office meeting with Soviet Foreign Minister Andrei Gromyko. 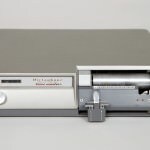 Photos of the actual Dictaphone recorder JFK used in the White House to record telephone calls and dictation.